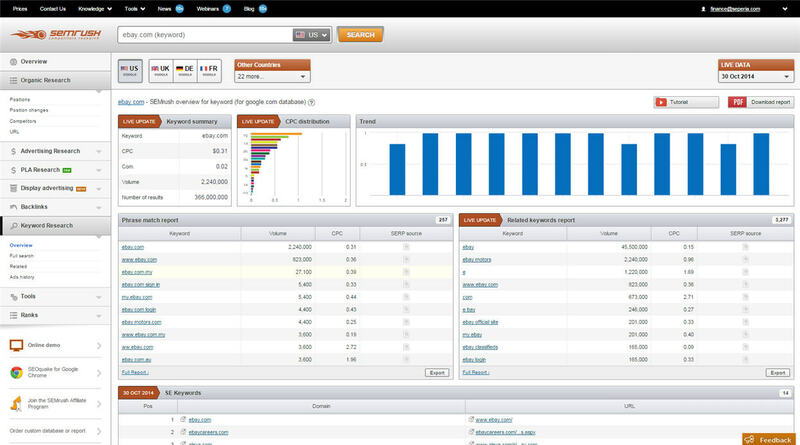 SEMrush is a web based competitive intelligence tool, allowing users to track not just their own, but also their competitors’ organic and paid keyword activity. The tool crawls the search engine result pages (SERPs) of Google and Bing US to identify and collect the top 20 results for both organic and paid keyword searches. With a database that is continuously growing, SEMrush claims to collects data for more than 100 million keywords and 71 million domains. The information provided allows users to better understand their competition by presenting comprehensive data about keywords, organic rankings for domains and landing URLs, backlink analysis, AdWords ad copies, CPC and ad positions, search and traffic volumes and more. 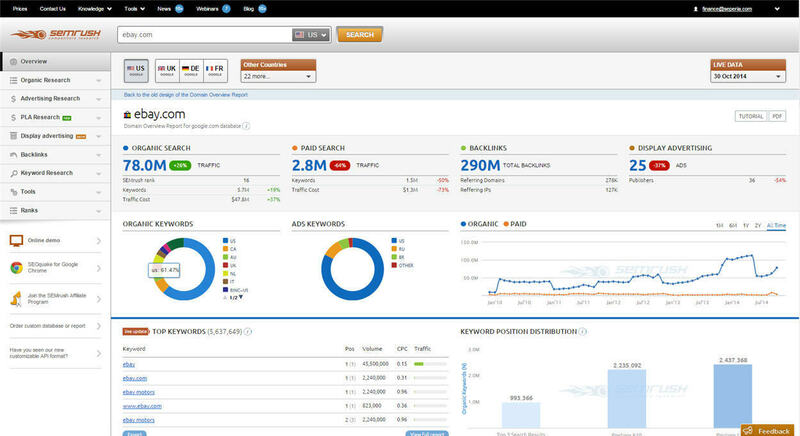 The tool provides business intelligence necessary to develop better search marketing & advertising strategies. The program is designed for SEO/SEM professionals, does not require downloading and is subscription-based. Presents samples of the following reports for a specific domain name or URL. Here you can track the top 20 SERP rankings of organic keywords for any domain/URL, create domain vs. domain reports to analyze keywords of competitors, discover potential ads/traffic buyers- see competitors that are ranking in PPC for keywords you rank organically with. Displays similar data to the Organic Research’s Positions Report and Competitors Report, for paid ads. 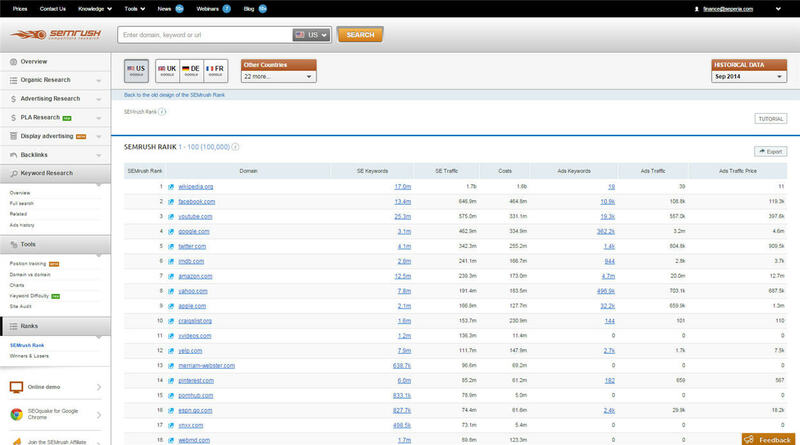 Also features ad text reports, ad history and potential ads/traffic sellers report. Check how a domain’s Product Listing Ads are performing in Google’s shopping results and the keywords for which they are ranking. Discover a domain or URL’s display ad advertisers and whether it publishes display ads too. Text and media ads as well as landing pages can also be discovered. Backlinks data is presented for domain name, URL or host name. Includes internal and external links analysis. Includes a phrase match report, related keywords report and organic results for selected keywords. Ad history is also available to analyze the last 12 months of competitors’ keywords activity. Offers SEO and SEM tools including position tracking, domain vs. domain, charts, keyword difficulty and site audit. The ‘SEMrush Rank’ rates the selected domain against 40 million domains based on traffic/costs/ad keywords etc. Also features a ‘Winners and Losers’ rank. SEMrush offers three paid packages as well as a free account with limited access to the tool’s reports and features. The free account allows users to perform 10 requests per day, showing just 10 results per report. PRO (can be paid for monthly at $79.95/mth or recurring for $69.95/mth): Recommended for regular users, this package offers up to 10,000 results per report and up to 3,000 reports per day. It enables the tracking of 5 campaigns, including 500 keywords and offers 200,000 units of API access. The plan allows for 1 simultaneous session and also offers display advertising research (currently in beta). Guru ($149.95/month): Recommended for agencies, this package offers the above features plus an extra 20,000 results per report and extra 2,000 reports per day. Branded PDF reports and historical data is also included (dating back to Jan ’12) and tracking is offered for 50 campaigns and 1,500 keywords). Users are allowed 3 simultaneous sessions and API access (500,000 units) through the Guru package and are also offered priority support. Enterprise ($499/mth): this package is optimized for big sites, offering 100,000 results per report and 10,000 reports per day. All of the previously mentioned features are included but have been upgraded: 1,500,000 units of API access, unlimited campaigns tracking, tracking of up to 5000 keywords, 10 simultaneous sessions plus expert consultations. SEMrush collects SERP data for more than 100 million keywords and 71 million domains. The tool presents keyword results for any domain ranked in Google’s (and Bing US’s) top 20 search results or that purchases AdWords. 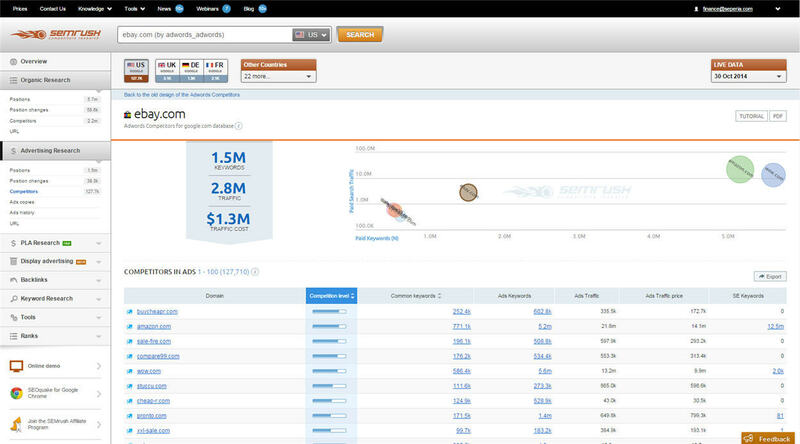 As the main purpose of SEMrush’s data is for competitive analysis, data is collected and compared on a national level. SEMrush uses its Live Update algorithm to refresh and update its 26 databases, based on the popularity of keywords in Google’s database. Depending on the popularity and search volume of keywords, databases are updated daily, weekly or monthly. To report on the reliability of the tool’s data, Seperia’s SEO team ran a number of tests, comparing one of our client’s keyword and traffic data from SEMrush to google.com results and data reported by Google Analytics. We performed Google searches for 20 keywords and matched the SERP results against the organic keyword rankings presented by SEMrush. Out of 20 keywords searched, the SERP results in google.com were only mismatched to SEMrush’s keyword report 4 times. And for every ranking that did not correlate, the difference in rankings was only 1 position, indicating the accuracy of SEMrush’s keyword data. The tool reported that for October 2014, the client’s organic traffic reached 335,000 users. However, according to Google Analytics, the client’s organic traffic for that same period was reported as 520,000 sessions, or 430,000 users (unique sessions). Upon first look, the traffic measure is clearly not as accurate as Google Analytics. Having said that, the traffic data reported still offers a good indication of its scale- whether it is in the tens or hundreds of thousands, or millions- especially when compared to other tools on the market. SEMrush caters to SEO & SEM professionals who need to get a general indication on the SEO/SEM status of websites, as well as to business owners who wish to compare their own site’s SEO/SEM performance with that of their competitors. 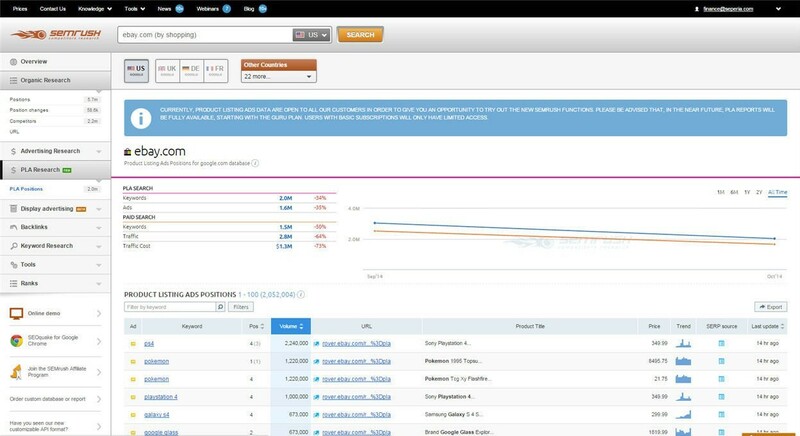 The main advantage of SEMrush compared to other website intelligence tools is that it focuses in particular on SEO and SEM metrics, and provides data based on crawling the SERPs in large scale. 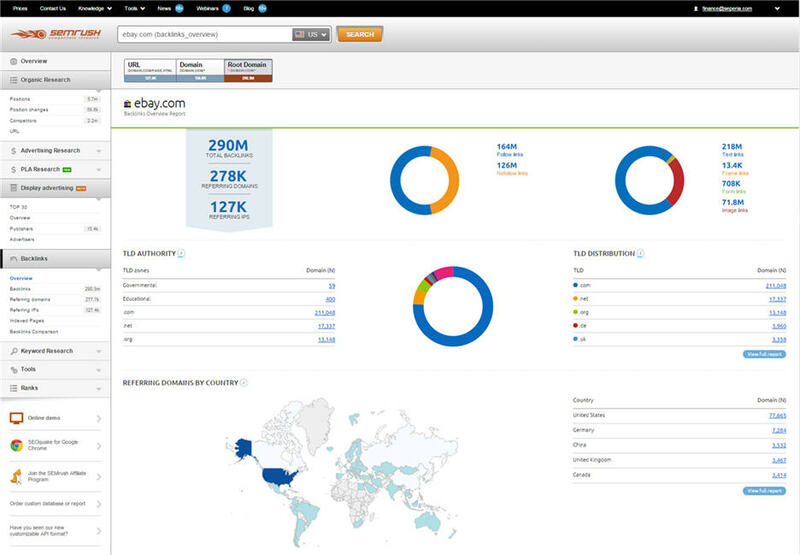 SEMrush offers a very simple, visually appealing and easy to use interface. Users can seamlessly navigate through the platform to find the reports they need. The data is presented through user-friendly dashboards, displayed in various presentation formats, such as: clear graphs, colorful pie charts, report tables. 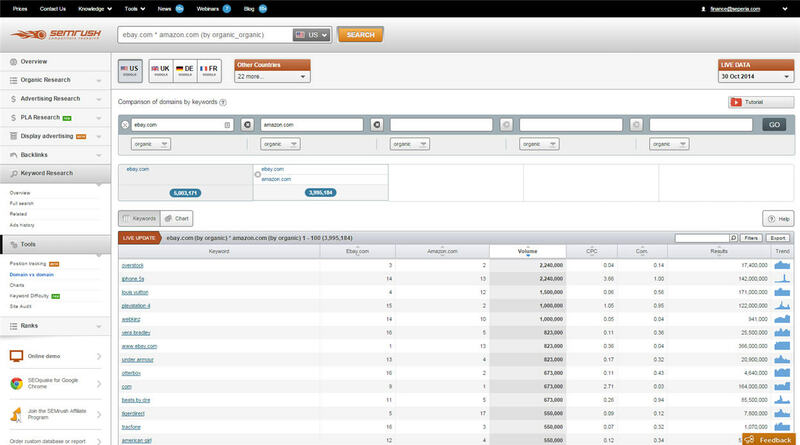 Data Export – Users can export SEMrush reports in CSV, XLS, and PDF. Custom reports – There is a possibility to schedule production & delivery of custom reports directly in your mailbox. SEMrush API – API permits users to integrate SEMrush data within their software without having to go through the SEMrush interface. 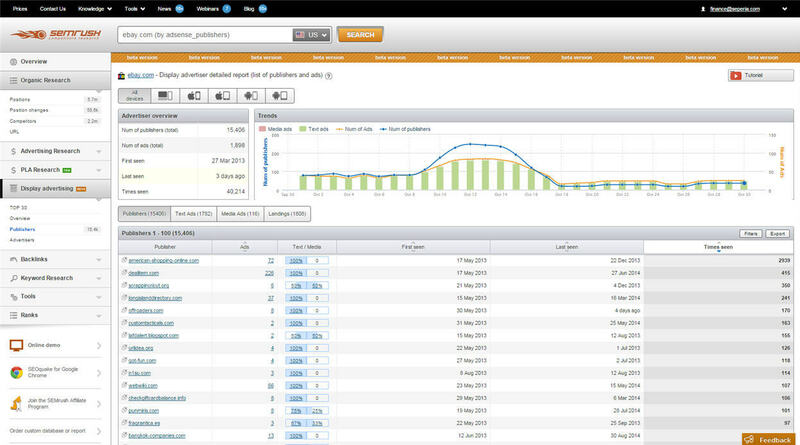 The SEMrush website also features live webinars and easy to follow video tutorials can be accessed from each dashboard. The site also maintains an up-to-date blog, with articles discussing a variety of topics that will appeal to online marketers. The company’s keyword-position tracking feature stands out from most of its competitors. You will get real-time reports of how your keywords are performing, including an instant comparison with your competition. The new PLA research dashboard is a real bonus for e-commerce sites. Lack of social media data integration. Does not offer a thorough analysis of other online traffic resources, other than organic or paid traffic. Organic traffic report not as reliable compared as competitors’ reports. SEMrush is your keyword private investigator, hot on the heels of your competitors AdWords and keyword activity. The website and keyword data are refreshed so often that your competitive analysis and keyword (organic and paid) research will always be up-to-date, paving the way for more efficient SEO and PPC campaign development. The tool is generally clear, intuitive and engaging. The competitive intelligence gained from this tool can also be used for strategic online planning, such as finding potential gaps in your industry that are yet to be targeted by your competitors- a great way to tap into new segments of the market. Whilst the traffic analysis provided by the tool may not align with your traffic reports in Google Analytics, the keyword data is highly accurate. SEMrush can be referred to with great confidence when performing a competitive analysis or planning your next SEO or PPC campaign. 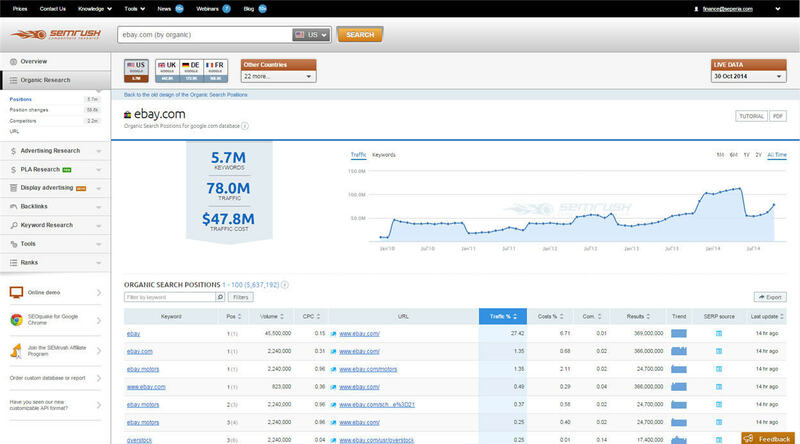 SEMrush is definitely one tool search marketers shouldn’t be without. Do you use SEMrush? Tell us about your experiences with this competitive intelligence tool.